This policy brief is one of six commissioned by the Department of Health and Human Services, Office of the Assistant Secretary for Planning and Evaluation on Medicaid eligibility policies for long-term care benefits. This brief summarizes the estate recovery mandate, discusses variations in mechanisms employed by states to implement the mandate, and presents a state-by-state analysis of collections from 2002 through 2004. The remaining briefs address: Medicaid Treatment of the Home; Spouses of Medicaid Long-Term Care Recipients; Medicaid Liens; Medicaid Estate Recovery programs; and A Case Study of the Massachusetts Medicaid Estate Recovery Program. State Medicaid programs are administered within broad federal guidelines and are financed jointly by states and the Federal Government. 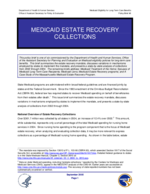 Since the 1993 enactment of the Omnibus Budget Reconciliation Act (OBRA 93), federal law has required states to recover Medicaid spending on behalf of beneficiaries from their estates after death.1 This issue brief summarizes the estate recovery mandate, discusses variations in mechanisms employed by states to implement the mandate, and presents a state-by-state analysis of collections from 2002 through 2004.